Lightly crush the raspberries with a fork, fold through the yoghurt and icing sugar. Divide the muesli between 4 glasses. Top each with 1 tablespoon of honey. 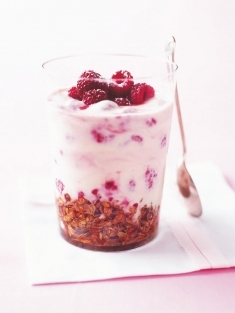 To serve, spoon over the yoghurt mixture, top with the extra raspberries and spoon over remaining honey. Serves 4.